President Donald Trump has inherited from Obama the mantle as the world’s worst presently operating state terrorist, serial invader, war criminal, killer of children, opiate drug pusher and climate criminal. Trump’s Riyadh speech was a narcissistic concoction of fake news through lying by omission and lying by commission as Religious Right America and Wahabi Islamist Saudi Arabia are united in genocidal wars against starving Yemen and devastated Syria, a phony war on Iran, and a greed-driven, climate criminal war on the Planet. 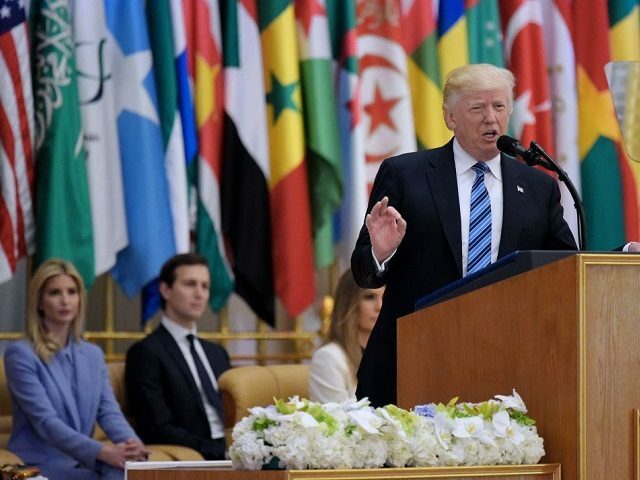 President Donald Trump’s speech in Riyadh, Saudi Arabia, was on the occasion of his first foreign trip as president of the US . Below is a succinct and systematic analysis of the lies of omission and lies of commission uttered by this mendacious, racist and narcissistic warmonger. “The magnificent Kingdom of Saudi Arabia” is a brutal, US-backed dictatorship that denies basic human rights to the 50% of its population who are female. Saudi Arabia is the primary funder, facilitator and ideological inspirer of Wahabi Islamist jihadism that has repeatedly proven to be of the greatest assistance to US imperialism – every jihadi atrocity against White members of the US Alliance has provided the key asserted justification for further genocidal US and US Alliance state terrorism and horrendous violence against the Muslim world. Afghanistan: President Ashraf Ghani ; Albania; Algeria: Abdelkhader Bensalah, President of the Council of the Nation; Azerbaijan: President Ilham Aliev; Bahrain: King Isa bin Salman Al Khalifa; Bangladesh: Prime Minister Sheikh Hasina; Benin; Brunei: Sultan Hassanal Bolkiah; Burkina Faso: President Roch Marc Kabore; Cameroon; Chad: President Idris Deby; Comoros; Djibouti; Egypt: President Abdel Fattah el-Sisi; Gabon: President Ali Bongo; The Gambia: President Adama Barrow; Guinea; Guinea-Bissau; Guyana; Indonesia: President Joko Widodo; Iraq: President Foua Masoum; Ivory Coast: President Alassane Ouattara; Jordan: King Abdullah II; Kazakhstan: President Nursultan Nazarbayev; Kuwait: Emir Sabah Al-Ahmad Al-Jaber Al-Sabah; Kyrgyzstan; Lebanon: Prime Minister Saad Hariri; Libya; Malaysia: Prime Minister Najib Razak; Maldives: President Abdulla Yameen; Mali; Mauritania; Morocco: Minister of Foreign Affairs Nasser Bourita; Mozambique; Niger: President Mahamadou Issoufou; Nigeria; Oman: Deputy Prime Minister Fahd bin Mahmoud al Said; Pakistan: Prime Minister Nawaz Sharif; State of Palestine: President Mahmoud Abbas; Qatar: Emir Tamim bin Hamad Al Thani; Saudi Arabia; Senegal: President Macky Sall; Sierra Leone; Somalia: President Mohamed Abdullahi Farmaajo; Sudan: Minister of State Taha al-Hussein; Suriname; Tajikistan: President Emomali Rahmon; Togo; Tunisia: President Beji Caid Essebsi; Turkey: Minister of Foreign Affairs Mevlut Cavusoglu; Turkmenistan; Uganda; Uzbekistan: President Shavkat Mirziyoyev; Yemen; United Arab Emirates: Crown Prince of Abu Dhabi Mohammed bin Zayed Al Nahyan; and, of course the USA . (a) Morocco was present but Morocco’s King Mohammed VI cancelled his attendance a week prior to the summit for unspecified reasons (partly Morocco-occupied Western Sahara, population 0.5 million, was not invited) and Sudan’s President Omar al-Bashir declined to attend after the US objected to his presence (the cowardly, racist and war crimes-complicit International Criminal Court (ICC) has charged him with war crimes but notably only prosecutes non-Europeans or Serbians as war criminals, conspicuously failing to prosecute George Bush, Tony Blair, Barack Obama, John Howard, Hillary Clinton or Donald Rump for war crimes). (b) Pakistan (population 203 million) and Bangladesh (population 163 million) were invited but not invited were the largely Muslim entities of Iran (population 79 million), Syria (population 19 million, 11 million of them now refugees), the Gaza Concentration Camp (population 2 million) or the Palestinian Diaspora outside Zionist-occupied Palestine (6 million people). Similarly not invited were India (population 1,329 million, Muslim population 266 million), China (population 1,378 million, Muslim population 138 million), the Philippines (population 102 million, Muslim population 10 million), Thailand (population 65 million, Muslim population 7 million) or Myanmar (population 52 million, Muslim population 8 million) . India (Muslim population assertedly 266 million), arguably ranks first in the world, followed by Indonesia (population 261 million) and Pakistan (population 189 million) as the country with the biggest Muslim population. The Riyadh Summit attendee the US has a population of 324 million of which 7 million are Muslims . The misogynist, war criminal, climate criminal, human rights-abusing and Islamofascist Saudi dictator, King Salman, was choosy about which Muslim leaders or representatives were invited to The Riyadh Summit. (c). The war criminal Saudi-led coalition making war on the Indigenous Houthis of starving Yemen include the state terrorist nations of Saudi Arabia, United Arab Emirates, Bahrain, Kuwait, Jordan, Morocco, Qatar, Senegal, Sudan, United States (drone strikes, special forces, naval blockade), United Kingdom (arms supplies and associated military advisors ),France (arms supply and personnel), and US lackey Australia (key involvement in drone strike targeting via Pine Gap in Central Australia and in permitting Australians to be involved as mercenaries with the Saudi invaders). The variously Saudi-backed Al-Qaeda and ISIS non-state terrorists are fighting against the secular Houthi Yemenis just as they are fighting against the secular Assad regime in Syria i.e. these jihadi non-state terrorists have common cause with the Saudi Alliance and US Alliance in trying to destroy Shia-linked and Iran-supported secular governments in both Yemen and Syria. Trump is paradoxically involved in supporting both state terrorists (like Saudi Arabia and Qatar) and jihadi terrorists (like al-Qaeda and IS) in Yemen and Syria. (d) Of the Middle East countries invited to the Riyadh Summit only Tunisia, Turkey, Azerbaijan, Iraq and Lebanon are recognizably “democratic” as are the non-invited Iran and the Gaza Concentration Camp ruled by the overwhelmingly popular Hamas. In contrast, Trump America has a president elected with minority support, Hillary Clinton having obtained more votes than Donald Trump. However in stark contrast the remaining invited Middle Eastern countries are dictatorships – Egypt, Jordan, Libya, Kuwait, Qatar, Saudi Arabia, Oman, Saudi-occupied Yemen, and United Arab Emirates are dictatorships. The US-backed Egyptian military dictator el-Sisi removed Egypt’s first ever democratically-elected government, banned the popularly elected Muslim Brotherhood Party, killed thousands of its supporters and jailed thousands more. Of the countries with major Muslim populations that were not invited, India, Myanmar and the Philippines are Western-style democracies but China and Thailand are not. (e) Nuclear terrorist, racist Zionist-run, genocidally racist, democracy-by-genocide Apartheid Israel rules a 51% majority Indigenous Palestinian population of 6.4 million (mostly Muslims) and does so with an iron first. While Apartheid Israel was not invited, the star attraction was Zionist-subverted, Zionist-perverted and pro-Apartheid Trump America that is the world’s number 1 supporter of Apartheid Israel, followed closely by pro-Apartheid and US lackey Australia. (f) Of 20 countries sanctioned by the US Alliance or variously invaded by US Alliance forces since the US Government’s 9-11 false-flag atrocity – Afghanistan, Burkina Faso, Central African Republic, Chad, Côte D’Ivoire, Djibouti, Iraq, Iran, Lebanon, Libya, Mali, Mauritania, Niger, Pakistan, Palestine, Philippines, Somalia, Sudan, Syria and Yemen – all but Iran, Syria, Central African Republic and the Philippines were invited to the Riyadh Summit. US Alliance intervention in these 20 countries has been associated with 32 million deaths from violence (5 million) or from deprivation (27 million) since the US Government’s 9-11 false flag atrocity [4, 5], and of the 65 million refugees in the world today about half are Muslims who are mostly fleeing violence by the US Alliance and Apartheid Israel – a Muslim Holocaust (millions actively or passively killed) and a Muslim Genocide, with genocide as defined by Article 2 of the UN Genocide Convention as “acts committed with intent to destroy, in whole or in part, a national, ethnical, racial or religious group” . (g) Of those countries invited to the Riyadh Summit, Afghanistan, Palestine and Somalia are under violent occupation by the genocidal and war criminal US Alliance. Occupation (and indeed hegemony associated with military intervention) is subject to Articles 55 and 56 of the Geneva Convention Relative to the Protection of Civilian Persons in Time of War. that unequivocally state that an Occupier must supply life-sustaining food and medical supplies to the Conquered “to the fullest extent of the means available to it” . Under-5 infant mortality (deaths under age five per 1,000 live births) in the Occupied Palestinian Territory (23) is 5.8 times greater than in Apartheid Israel (4) and under-5 infant mortality in Occupied Afghanistan (92.5) and Occupied Somalia (123.5) is 14.2 and 19.0 times greater , respectively, than that in the US (6.5), this being evidence of gross violation of the Geneva Convention by neo-Nazi Apartheid Israel and by the Neocon American and Zionist Imperialist (NAZI)-perverted and subverted US. (h) In summary, the silence of the 55 countries attending the Riyadh Summit makes them complicit in the ongoing Muslim Holocaust and Muslim Genocide imposed on the Muslim world by Apartheid Israel, the US and the US Alliance . Trump makes no mention of the third most holy Muslim site, namely the Al Aqsa Mosque in Jerusalem that still remains subject to repeated violation in the highly abusive hands of US-backed, anti-Arab anti-Semitic and Islamophobic Apartheid Israel . The likely outcomes in the “record investments in the military” are more of the same in the ongoing Muslim Holocaust and Muslim Genocide summarized in 2(f) and 2(g) above. This obscene “defence purchase” is a gross misnomer – while Apartheid Israel- vilified and US-vilified Iran has not invaded another country for centuries, a serial war criminal Saudi Arabia invaded Sunni-ruled, Shia-majority Bahrain in 2011 (followed by mass arrests, torture and killing), is presently making genocidal war on starving Yemen with its US Alliance allies, and through its continuing support for jihadi rebels (Al-Nusrah, Al-Qaeda and IS) has devastated Syria (0.5 million Syrians killed, 11 million refugees). Serial war criminal Saudi Arabia has a vile record of bloody participation in the Zionist-backed US War on Muslims . There is a strong case for Muslim theologians arguing for a suspension of the Haj obligation (or an alternative location found outside Saudi Arabia) until the Saudi dictatorship is democratically overthrown and punished for the violent abuse and mass murder of Muslims. Donald Trump’s “terror hysteria” is an immense lie. No mention is made of the horrendous reality of state terrorism – US Alliance state terrorism, NATO state terrorism, US state terrorism, UK state terrorism, French state terrorism, German state terrorism, Apartheid Israeli state terrorism, Canadian state terrorism, Australian state terrorism, Saudi state terrorism, Qatari state terrorism, and Turkish state terrorism [11, 12] – that has devastated the Muslim world from Western Sahara to the Philippines since the US Government’s 9-11 false flag atrocity that killed about 3,000 people [4, 5, 9]. Numerous science, engineering, architecture, explosive demolition, aviation, military, and intelligence experts have conclude that the US was responsible for 9-11 with clear evidence for Saudi and Apartheid Israeli involvement. Even Donald Trump and Al Gore, who like the Western Mainstream media, politician and academic presstitutes accept the men-in-caves-did-it, lying Bush, “official version of 9-11”, conclude that the US Government permitted 9-11 to happen through egregious incompetence, and it is a quite plausible step from incompetence that is egregious to incompetence that is so egregious as to constitute deliberate inaction . Indeed it is possible that the hatred of Trump from the US elites is covertly exacerbated by criminals in the US Government alarmed by his blabber-mouth skirting of 9-11 truth. All terrorism is evil and vile whether it is non-state jihadi terrorism (like the initially US Alliance-backed Al-Qaeda or the barbarous IS that was born out of the war criminal US invasion of the secular state of Iraq and has been variously covertly supported by the US, UK, France, Turkey, Apartheid Israel, Jordan, Saudi Arabia and Qatar) or the vastly more deadly state terrorism (e.g. US Alliance state terrorism that in the 21st century has been waging a genocidal war on Muslims from Western Sahara to the Philippines) [4, 11, 12]. The US has a long record of covertly supporting non-state terrorists to further its aims e.g. Gladio (that committed atrocities in Europe that were blamed on Communists) , rightist Ecuadorean terrorists (who would bomb Catholic churches so that socialists would be blamed) , and Al-Qaeda and Taliban jihadis (that fought the Russian invasion after the US engineered the removal of Afghanistan’s democratic and secular government in 1978) . Indeed on the basis that “the enemy of my enemy is my friend”, IS and Al-Qaeda jihadis are allies of Trump America because they have been variously backed by members of the US Alliance (most notably by Islamofascist Saudi Arabia and Qatar) in devastated Syria and starving Yemen. Trump has applied descriptives to jihadi terrorism of “humanitarian and security disaster in this region that is spreading across the planet… a tragedy of epic proportions. No description of the suffering and depravity can begin to capture its full measure”. However these descriptives could be accurately applied to deadly and genocidal US Alliance state terrorism from Western Sahara eastwards to the Philippines. Since 9-11 only about 60 Americans have been killed by jihadi terrorists in America (but 26 million Americans have died preventably from various causes linked to government inaction) [16-20] and only 2 Australians have been killed in Australia by jihadis (but 1.3 million Australians have died preventably from various causes linked to government inaction) [21, 22] – however Muslim deaths in 20 countries invaded by the US Alliance since the US Government’s 9-11 false flag atrocity total 32 million including 5 million from violence and 27 million through imposed deprivation [4, 15]. The world’s present number 1 terrorist, Trump, falsely puts “ISIS, Al Qaeda, Hezbollah, Hamas” in the same basket. IS arose as a Sunni Iraqi revolt against the US invaders and the US-installed Iraqi regime and thence evolved into its present barbarism jihadism. Al-Qaeda arose as US-backed jihadis opposed to secular democray and the Russian invasion of Afghanistan but now has a wider barbarous reach, notably in devastated Libya, Syria and Yemen. Hezbollah and Hamas have massive popular support as Indigenous defenders of Lebanon and Palestine, respectively, against the genocidal violence of US-backed Apartheid Israel. Indeed while Trump failed to get a majority of votes in the US presidential election, Hamas overwhelmingly won the 2006 Palestinian elections held under Apartheid Israeli guns, and Hezbollah has overwhelming electoral support from the Shia Muslims of Lebanon for representation in the Lebanon Parliament. Of course Hamas and Hezbollah have been listed and vilified as terrorist organizations by democracy-by-genocide Apartheid Israel (that prevents 73% of its 51% majority Indigenous Palestinian population from voting for the government ruling it) and by the pro-Apartheid US and pro-Apartheid, US lackey Australia. US state terrorism and US Alliance state terrorism have devastated the Muslim world in the 21st century. No mention by mendacious Trump that US-backed Apartheid Israel violates the third holiest site in Islam, the Al-Aqsa Mosque in Apartheid Israel-occupied Jerusalem . “The potential of this region” is severely hamstrung by the reality that of the Middle East nations only Tunisia, Turkey, Occupied Palestine, Lebanon and Iran are democratic in a recognizably Western sense. Saudi Arabia and Egypt are ruled by brutal, war criminal, anti-democracy regimes. “This untapped potential, this tremendous cause for optimism” is indeed “held at bay by bloodshed and terror” imposed by the US Alliance (including Apartheid Israel) that has invaded 20 largely or substantially Muslim countries since 9-11 (3,000 US-, Apartheid Israel- and Saudi-complicit deaths) , this being associated with 32 million Muslim deaths from violence (5 million) or from imposed deprivation (27 million) . “The potential of this region” (the Middle East) can be readily exampled by Apartheid Israel-occupied Palestine. A peaceful, secure, non-racist, just, one-person-one-vote Palestine would be a marvellous Mecca for Christian, Muslim, Jewish and other tourists and economically transform the region. This can and should happen now as summarized by my following comment in response to an Australian ABC program on a One State solution: “As an anti-racist Jewish Australian I applaud anti-racist Jewish Israeli Nir Baram for the humane rationality of his “A Land Without Borders” and his honest declarations: “The 2 state solution … is totally dead” and “immorality of the Occupation”. The World must demand an end to race-based Apartheid Israel after the example of post-Apartheid South Africa and its replacement by a unitary state in Palestine with return of all refugees, zero tolerance for racism, equal rights for all, one-person-one-vote, justice, goodwill, reconciliation, airport-level security, internationally-guaranteed national security initially based on present armed forces, and untrammelled access for all citizens to all of the Holy Land” . Instead of this instant possibility of peace and prosperity in Palestine we have the ugly and deadly reality of US-backed Israeli Apartheid in Palestine. Of over 12 million Indigenous Palestinians (half of them children), over 6 million are forbidden to step foot in Palestine on pain of death; 2 million are highly abusively and indefinitely confined to the Gaza Concentration Camp; 2.7 million exist without human rights under Israeli guns in ever-diminishing West Bank ghettoes or mini-Bantustans; and 1.7 million “lucky” Indigenous Palestinians exist as citizens of Apartheid Israel, albeit as third-class citizens under Nazi-style, Apartheid Israeli race laws. Palestinian deaths since 1935 in the ongoing Palestinian Genocide total 2 million, 0.1 million from violence and 1.9 million from imposed deprivation. The “annual per capita GDP” is $2,800 for Occupied Palestinians as compared to $38,000 for Apartheid Israelis [24-26], this being a deadly differential because over 4,000 Occupied Palestinians die avoidably from deprivation each year as compared to zero (0) Israelis [15, 26] . In the 21st century there have been 1,615 non-terrorism Israeli deaths from homicide by Israelis, 164 Israeli deaths from terrorism in Israel (excluding Jerusalem) , 1,183 further Israeli deaths from terrorism elsewhere in Zionist-ruled Palestine, 9,505 Occupied Palestinians violently killed by Israelis, and 72,000 Occupied Palestinian avoidable deaths from imposed deprivation . One notes that Israel deaths from Gaza rockets and, mortars totalled 32 in the period 2004-2017 . Behind the deadly, Zionist-promoted, warmongering, and civil rights-abusing terror hysteria in US Alliance countries – as exemplified by pathological liar Trump’s Riyadh Speech – is the Awful Truth that deaths from jihadi terrorism in these countries – while appalling – is negligible compared to over 30 million Muslim deaths from violence or imposed deprivation in the 21st century, Zionist-promoted US War on Muslims. Indeed the carnage is so great that guided by Article 2 of the UN Genocide Convention one must now talk of a Palestinian Genocide , an Iraqi Holocaust and Iraqi Genocide , an Afghan Holocaust and Afghan Genocide , a Libyan Genocide  , a Syrian Genocide , a Somali Holocaust and Somali Genocide , and a Muslim Holocaust and Muslim Genocide . Yet, as exemplified by mendacious Trump’s Riyadh speech, the Mainstream media, politician and academic presstitutes resolutely look the other way and ignore the Muslim Holocaust and Muslim Genocide perpetrated by the Neocon American and Zionist Imperialist (NAZI)-perverted US Alliance. On very rare occasions a member of the Establishment will make a hole in the Mainstream Media Wall of Silence (that is thence rapidly repaired, of course). Thus on May 12, 1996 in a “60 Minutes” TV segment anti-racist Jewish American journalist Lesley Stahl asked US UN representative (and later US Secretary of State) Madeleine Albright “We have heard that half a million children have died. I mean, that’s more children than died in Hiroshima. And, you know, is the price worth it?” to which Albright notoriously replied “We think the price is worth it” . A decade later in 2007 Alan Greenspan (who had served as chairman of the US Federal Reserve for almost two decades) admitted: “I am saddened that it is politically inconvenient to acknowledge what everyone knows: the Iraq war is largely about oil” . On this 2-strikes-in-2-decades basis we might hope for a further such hole in the Mainstream Media Wall of Silence in 2017. Again serial war criminal Trump ignores the massive reality of state terrorism that is far, far worse than the vile barbarism of jihadi non-state terrorism (see point #7 above). However there is a massive inconsistency in lying Trump’s assertions. He is evidently content with the state terrorism of Saudi Arabia and its blatant support of fundamentalist Sunni Muslim jihadi groups (IS, Al-Qaeda and related groups) in Syria and the Yemen. In demanding “drive them out of this Earth” , Trump calls for the total extirpation of Sunni jihadi terrorists (genocide according to Article 2 of the UN Genocide Convention), but he is more than content with Saudi Arabia that is the principal exponent of Wahabi religious extremism and violent Islamofascism. Indeed the Awful Truth is that a fundamentalist religious right-dominated America has violently trashed secular governance, modernity, and women’s rights in the Muslim World, notably in Afghanistan, Libya, Iraq, and now Syria . Of course a humane alternative to genocidal extirpation of jihadis (with immense collateral civilian deaths as in Mosul and Fallujah) is negotiated settlement as exemplified by ultra-Islamic Aceh in moderately Muslim Indonesia. What gross deception and hypocrisy by mendacious Trump. America has invaded 72 countries, subverts every country on Earth, has military bases in 75 countries, and is presently waging war in 7 largely Muslim countries (devastated Libya, starving Somalia, starving Yemen, devastated Iraq, devastated Syria, devastated Afghanistan, and impoverished Pakistan) as well as in the impoverished Philippines [4, 31-33]. IS was substantially funded by selling oil via US ally Turkey to various countries with US ally Apartheid Israel having been the major purchaser. According to anti-racist Jewish American writer Stephen Lendman: “Israel directly aids ISIS, providing weapons, munitions and medical treatment for its wounded fighters, along with intermittently bombing Syrian targets. It’s complicit with Obama’s regional wars, including by profiting from stolen Syrian and Iraqi oil” . Hezbollah, described by the world’s number 1 state terrorist Donald Trump as a terrorist organization, has immense popular support as an Indigenous organization defending Lebanon from nuclear terrorist, racist Zionist-run, democracy-by-genocide Apartheid Israel, and accordingly has commensurate representation in the democratically-elected Lebanon Parliament. In contrast, most of the Middle Eastern governments invited to the Riyadh Summit are repressive military and/or royal dictatorships that are complicit in the Zionist-promoted, anti-Arab anti-Semitic US War on Muslims and the resultant Muslim Holocaust and Muslim Genocide [4, 9]. US-allied, Wahabist Saudi Arabia is the ideological and financial source of Sunni Muslim-origin jihadi terrorism. Bahrain’s asserted “anti-terrorism” involves the Saudi-enabled imprisonment, torture and killing of members of its Shia majority. Ignoring US Alliance and Apartheid Israeli generation of millions of refugees: “I also applaud Jordan, Turkey and Lebanon for their role in hosting refugees. The surge of migrants and refugees leaving the Middle East depletes the human capital needed to build stable societies and economies. Instead of depriving this region of so much human potential, Middle Eastern countries can give young people hope for a brighter future in their home nations and regions… make this region a place where every man and woman, no matter their faith or ethnicity, can enjoy a life of dignity and hope. There are 65 million refugees in the world today  and about half of them are Muslim refugees from US Alliance violence, the breakdown including 7 million Palestinians, 11 million Syrians, 5-6 million Iraqis, 3 million Afghans, 2 million Somalis, 1 million Pakistanis, 1 million Libyans, and 0.1 million Central African Republicans . In generating over 30 million refugees – driving over 30 million impoverished people from their homes and their countries – the US Alliance is guilty of genocide, violating Article 2 of the UN Genocide Convention that defines genocide as “acts committed with intent to destroy, in whole or in part, a national, ethnical, racial or religious group” . Palestinian president Mahmoud Abbas ostensibly and formally rules the 2.7 million Indigenous Palestinians of the war criminally occupied West Bank. Racist Trump will not meet representatives of Hamas that overwhelmingly won the 2006 Occupied Palestinian elections held under Israeli guns . The victorious Hamas MPs were labelled as “terrorists” by Apartheid Israel, the US and by the pro-Apartheid US lackeys of the US Alliance, and were variously killed, imprisoned or exiled to the Gaza Concentration Camp. For racist warmonger Trump, terrorists are people he doesn’t like. The Indigenous Palestinian Hamas, like the WW2 French Resistance and the African National Congress (ANC), illustrates the adage that “One man’s terrorist is another man’s freedom fighter”. World leading state terrorist Trump’s identification of Shia Iran as a supporter of “terrorism” stems from Iran’s support for the popularly supported Indigenous Houthis (subject to genocide and war criminal attack by the Saudis and the US Alliance in Yemen), the popularly supported Indigenous Hezbollah (that resisted Apartheid Israeli invasion and devastation of Lebanon), democratically popularly supported Indigenous Hamas (that resists the illegal and war criminal occupation of Palestine by Apartheid Israel), and for the Syrian government (subject to insurgency by moderate Syrians and jihadis backed by the US, UK, France, Turkey, Apartheid Israel, Qatar, Jordan and Saudi Arabia). Unlike pro-Apartheid, nuclear terrorist, Nuclear Non-Proliferation Treaty (NPT)-violating, nuclear disarmament-opposing, opiate drug pushing, and serial invader America and pro-Apartheid, nuclear terrorist, Nuclear Non-Proliferation Treaty (NPT)-violating, nuclear disarmament-opposing, leading Ecstasy trader  and serial invader Apartheid Israel, Iran supports democracy, rejects racism, has no nuclear weapons, is a signatory to the NPT, supports nuclear disarmament , supports a nuclear weapons-free Middle East, is the world leader in opposing opiate distribution from US-occupied Afghanistan  and has invaded no other country for several centuries (the US has invaded 72 countries and Apartheid Israel 12) [11, 12]. Nevertheless Neocon American and Zionist Imperialist (NAZI)-perverted and subverted Western Mainstream media ignore these stark discrepancies with deadly consequences in the West. Thus 1.2 million people have died world-wide since 9-11 due to US Alliance restoration of the Taliban-destroyed Afghan opium industry from 6% of world market share in 2001 to 93% in 2007, the breakdown (as of 2015) including 280,000 Americans, 256,000 Indonesians, 68,000 Iranians, 25,000 British, 14,000 Canadians, 10,000 Germans, 5,000 Australians . As discussed in point #5 above, this massive investment in America involves an obscene new $110 billion for US weapons of war to help “America, its industry and its jobs” and to help Saudi Arabia prosecute its war criminal wars on Muslims in devastated Syria and starving Yemen, In getting into bed with the medieval, women’s rights-violating, climate criminal, Saudi Islamofascists who have been linked to the 9-11 atrocity by the finally released “missing 28 pages” of the “official” 9-11 report , Trump will “do deals” with anyone, even those at the bottom of barrel. (a) The US has been prosecuting a bloody War on Muslims since the US Government’s 9-11 false flag atrocity. Muslim deaths in 20 countries invaded by the US Alliance since 9-11 total 32 million, 5 million through violence and 27 million through imposed deprivation. Saudi Arabia and other Middle East Islamofascist dictatorships are variously involved in helping the US prosecute a now global War on Muslims that amounts to a Muslim Holocaust and a Muslim Genocide. (b) With about 4% of the world’s population but consuming 25% of its resources, the US is disproportionately complicit in the Global Avoidable Mortality Holocaust in which 17 million people (half of them children) die annually in the Developing World (minus China) from deprivation and deprivation-exacerbated disease on Spaceship Earth with the obscenely wealthy First World One Percenters in charge of the flight deck. Wealthy, oil-rich Saudi Arabia and other wealthy oil and/or gas-rich Middle East Islamofascist dictatorships are similarly complicit in this continuing atrocity. (c) The US and the fossil fuel-rich Middle East Islamofascist dictatorships are disproportionately complicit in the worsening Climate Emergency and a worsening Climate Genocide. The Paris Climate Conference’s target of plus 1.5C will be exceeded in 4-10 years and a catastrophic plus 2C is now unavoidable [46, 47]. It has been estimated that about 0.5 million people die from Climate Change each year  but this may be a considerable underestimate since Climate Change impacts the tropical and subtropical Third World (minus China) in which 17 million people die avoidably from deprivation each year . It is estimated that 10 billion people may die this century in an horrendous Climate Genocide if man-made climate change is not requisitely addressed . The Climate Criminal US, Climate Criminal Saudi Arabia and other Climate Criminal Middle East Islamofascist dictatorships have annual per capita greenhouse gas (GHG) pollution ranging from 13.8 to 101.8 tonnes CO2-equivalent per person, 7 – 48 times greater than India’s 2.1 [42, 43]. (d) Trump America, Saudi Arabia and the other Middle East Islamofascist dictatorships have a common policy of unlimited fossil fuel exploitation. However Mainstream media , politician and academic presstitutes ignore the horrible reality that pollutants from burning fossil fuels are deadly. The World Health Organization (WHO) estimates that 7 million people die annually from air pollution, about half indoors and about half from outdoor air pollution (Ambient Air Pollution), the major pollutants including nitrogen oxides and carbon particulates (e.g. PM2.5 particulates) [50, 51]. Thus it is estimated that these annual deaths from Ambient Air Pollution include 9,400 Londoners , 1,108,100 Chinese, 1,090,400 Indians, 88,400 Americans, 78,600 Indonesians, 135,100 Pakistanis, 50,900 Nigerians, and 122,400 Bangladeshis . The State Terrorist countries of Trump America, Saudi Arabia and the other Middle East Islamofascist dictatorships are disproportionately involved in this Air Pollution Holocaust. (e) Utterly ignored by anti-science, neoliberal, greed-driven Trump, is the Awful Truth that about 1.7 million ordinary Americans die preventably each year from all kinds of preventable causes in what must be described as an American Holocaust , the breakdown (noting some overlaps) including (1) smoking-related causes (443,000), (2) adverse events in hospitals (440,000), (3) obesity-related causes (300,000), (4) air pollution (200,000), (5) alcohol (75,000), (6) lack of medical insurance (45,000), (7) illicit drug abuse (38,000), (8) motor vehicles (33,000), (9) guns (31,000), (10) suicide (30,000), (11) avoidable under-5 year old infant deaths (21,000), and (12) murder (15,000) [16, 18-20]. An average of 1.76 million Americans will die preventably each year under a 2-term Trump presidency or about 14 million in total . Under Bush and Obama the US committed the immense, criminal, post-9-11 fiscal perversion of committing $5-6 trillion to the War on Muslims and actively or passively killing over 30 million Muslims abroad rather than keeping 28 million Americans alive at home . However in a deliberate act showing criminal ignorance, criminal depraved indifference and criminal disregard for the lives of ordinary Americans, American-killing Trump proposes to hugely increase military expenditure and is presently involved in wars in starving Somalia, starving Yemen, devastated Syria, devastated Iraq, devastated Afghanistan , impoverished Pakistan and the impoverished Philippines. (f) State terrorist Trump’s terror hysteria-driven warmongering turns reality on its head. Thus about 60 Americans have been killed by terrorists in America since the US Government’s 9-11 false flag atrocity that killed 3,000 mostly American people [4, 5, 16-20] (one would hope that the governments of non-American victims of 9-11 would conduct their own expert inquiries into this atrocity – indeed failure to do so is evidence of depraved indifference). In stark contrast, 32 million Muslims have been killed by violence (5 million) or through deprivation (27 million) in the subsequent Zionist-promoted US War on Muslims (aka (US War on Terror) [4, 5. 9] and 28 million Americans died preventably under state terrorist Bush and state terrorist Obama with a further 14 million Americans set to die preventably under a 2-term state terrorist Trump . An average of 20 American veterans have suicided each day since 9-11 , this making Bush, Obama and Trump complicit through insufficient action in the deaths of about 20 veteran suicides per day x 16 years since 9-11 x 365.25 days per year = 117,000 US veteran preventable deaths through suicide since 9-11  as compared to 6,900 US combat deaths in Iraq and Afghanistan . Well might mendacious, state terrorist, Muslim-killing, and American-killing Trump invoke “God bless America”. (g), Oil was mentioned only once in Trump’s speech in relation to IS profiting from oil sales (see item #9 above) but of course lying Trump made no mention of the reality that Apartheid Israel is the major purchaser of IS oil via Turkey . Yet oil is the key to Western imperialism in the Middle East as recognized by expert commentators from the Right to the Left. Thus in relation to the Iraq War, Alan Greenspan (who served as chairman of the US Federal Reserve for almost two decades) (2007): “’I am saddened that it is politically inconvenient to acknowledge what everyone knows: the Iraq war is largely about oil”, and Professor Noam Chomsky (of 101-Nobel-Laureate MIT) (2009): “There is basically no significant change in the fundamental traditional conception that if we can control Middle East energy resources, then we can control the world”. Gas was not mentioned yet the huge gas deposits of Qatar and Iran are clearly of major importance. John Kennedy Junior (nephew of JFK and Democratic politics insider) has written in relation top the Syrian Civil War (2016): “Assad further enraged the Gulf’s Sunni monarchs by endorsing a Russian approved “Islamic pipeline” running from Iran’s side of the gas field through [northern Iraq] , Syria and to the ports of Lebanon. The Islamic pipeline would make Shia Iran instead of Sunni Qatar, the principal supplier to the European energy market and dramatically increase Tehran’s influence in the Mid-East and the world. Israel also was understandably determined to derail the Islamic pipeline which would enrich Iran and Syria and presumably strengthen their proxies, Hezbollah and Hamas” . (h) Utterly ignored by Trump and the Mainstream is the threat of methane (CH4) release to the planet. The world faces a worsening climate emergency due to global warming from ever-increasing atmospheric pollution with greenhouse gases (GHGs) of which the most important are carbon dioxide (CO2) and methane (CH4), noting that the Global Warming Potential (GWP) of CH4 is 21 times that of CO2 on a 100 year time frame but is 105 times greater than that of CO2 on a 20 year time frame and taking atmospheric aerosol impacts into account. Huge stores of CH4 as water-methane (H2O-CH4) clathrates in the Arctic tundra permafrost and on the Arctic Ocean sea bed may be released in coming decades due to global warming, with this release involving a disastrous positive feedback loop in which global warming causes CH4 release, thence more global warming and consequently even more CH4 release . CH4 is about 85% of natural gas. CH4 leaks (3.3% in the US based on the latest US EPA data and as high as 7.9% for methane from “fracking” coal seams; a 2.6 % leakage of CH4 yields the same greenhouse effect as burning the remaining 97.4% CH4) . The German WBGU (2009) and the Australian Climate Commission (2013) have estimated that no more than 600 billion tonnes of CO2 can be emitted between 2010 and zero emissions in 2050 if the world is to have a 75% chance of avoiding a catastrophic 2C temperature rise. The 50 billion tonnes of that is CH4 set to be released in coming decades from the East Siberian Arctic Shelf due to global warming is thus equivalent to 50 billion tonnes CH4 x 105 tonnes CO2-equivalent/tonne CH4 = 5,250 tonnes CO2-e or about nine (9) times more than the world’s post-2009 terminal carbon pollution budget. (i) Nuclear weapons, poverty and climate change are the 3 key existential threats to Humanity and the Biosphere  but were absent from Trump’s Riyadh Speech. Poverty already kills 17 million people each year . Unaddressed climate change is set to kill 10 billion people this century in a near-terminal Climate Genocide . However an accidental or deliberate nuclear war is set to wipe out most of Humanity and the Biosphere . Leading American economist and commentator Dr Paul Craig Roberts has recently stated “In previous posts in recent years I have pointed out both written documents and changes in US war doctrine that indicate that Washington is preparing a preemptive nuclear attack on Russia and China. More recently, I have shown that Washington’s demonization of Russia and President Putin, the incessant lies about Russian deeds and intentions, and the refusal of Washington to cooperate with Russia on any issue have convinced the Russian government that Washington is preparing the Western populations for an attack on Russia. It is obvious that China has come to the same conclusion. It is extremely dangerous to all of mankind for Washington to convince two nuclear powers that Washington is preparing a preemptive nuclear strike against them. It is impossible to imagine a more reckless and irresponsible act. Yet this is precisely what Washington has done” . This detailed analysis of President Donald Trump’s 2017 Riyadh Speech reveals it to be a “fake news” concoction of egregious lies of commission and lies of omission. Mendacious warmonger Trump is presently conducting wars in starving Somalia, starving Yemen, devastated Syria, devastated Iraq, devastated Afghanistan , impoverished Pakistan and the impoverished Philippines, and is threatening WW3 through wars on Russia, China, North Korea and Iran. What can decent Humanity do before it is too late? Decent Humanity must (a) inform everyone they can , and (b) apply Boycotts, Divestment and Sanctions (BDS) not just against nuclear terrorist Trump America and Trump America-backed, nuclear terrorist Apartheid Israel but against all Trumpist US Alliance countries and corporations complicit in the Muslim Genocide, the American Holocaust and the existential threats to Humanity from nuclear weapons, poverty and climate change.
. Rebecca Harrington, “Here’s the full transcript of Trump’s speech to Middle East leaders in Riyadh, Saudi Arabia”, Business Insider Australia”, 22 may 2017: https://www.businessinsider.com.au/trump-riyadh-saudi-arabia-transcript-video-speech-2017-5?r=US&IR=T .
. “Riyadh Summit, 2017”, Wikipedia: https://en.wikipedia.org/wiki/Riyadh_Summit_2017 .
. “Muslim population in the world”: http://www.muslimpopulation.com/asia/ .
. Convention on the Prevention and Punishment of the Crime of Genocide, Adopted by Resolution 260 (III) A of the United Nations General Assembly on 9 December 1948: http://www.hrweb.org/legal/genocide.html .
. Geneva Convention Relative to the Protection of Civilians in Time of War: http://www.icrc.org/ihl.nsf/385ec082b509e76c41256739003e636d/6756482d86146898c125641e004aa3c5 .
. “Al-Aqsa Mosque”, Wikipedia: https://en.wikipedia.org/wiki/Al-Aqsa_Mosque .
. “Operation Gladio”, Wikispooks: https://wikispooks.com/wiki/Operation_Gladio .
. Philip Agee, “Inside the Company: CIA Diary”.
. Gideon Polya, “Trump’s abolition of Obama Care will kill an estimated 43,000 Americans over 2Trump terms”, Global Research, 16 March 2017: http://www.globalresearch.ca/trumps-abolition-of-obamacare-will-kill-an-estimated-43000-americans-over-2-trump-terms/5580513 .
. Comment by Gideon Polya on “Journeys through the West Bank and East Jerusalem”, ABC Radio National, Saturday Extra, 6 May 2017: http://www.abc.net.au/radionational/programs/saturdayextra/a-land-without-borders/8480942 .
. Gideon Polya, “Fundamentalist America Has Trashed Secular Governance, Modernity, Democracy, Women’s Rights And Children’s Rights In The Muslim World”, Countercurrents, 21 May, 2015: https://countercurrents.org/polya210515.htm .
. Gideon Polya, “The US Has Invaded 70 Nations Since 1776 – Make 4 July Independence From America Day”, Countercurrents, 5 July, 2013: https://countercurrents.org/polya050713.htm .
. Jules Dufour, “The world-wide network of US military bases”, Global Research, 1 July 2007: http://www.globalresearch.ca/the-worldwide-network-of-us-military-bases/5564 .
. UNHCR, “Figures at a glance”: http://www.unhcr.org/en-au/figures-at-a-glance.html .
. “Hamas”, Wikipedia: https://en.wikipedia.org/wiki/Hamas .
. Cardinal Renato Martino quoted by Richard Owen, “”Concentration camp” remark threatens Pope’s visit to Israel’, Times Online, 8 January 2009: http://www.timesonline.co.uk/tol/news/world/middle_east/article5473588.ece .
. Gideon Polya, “Green Left Pope Francis Demands Climate Action “Without Delay” To Prevent Climate “Catastrophe””, Countercurrents, 10 August 2015: https://countercurrents.org/polya100815.htm .
. Pope Francis , Encyclical Letter “Laudato si”, 2015: http://w2.vatican.va/content/francesco/en/encyclicals/documents/papa-francesco_20150524_enciclica-laudato-si.html .
. Gideon Polya, “Western Mainstream Media Censor Green Left Pope Francis’ “Laudato Si’” Message For Urgent Action On Climate Change”, Countercurrents, 20 August 2015: https://countercurrents.org/polya200815.htm .
. Samuel M. Katz, “Israeli drug smugglers’ global monopoly on Ecstasy, Rense.com, 2 October 2015: http://rense.com/general24/israelidrugsmugglers.htm .
. “The 28 pages”, Wikipedia: https://en.wikipedia.org/wiki/The_28_Pages .
. “Are we doomed”: https://sites.google.com/site/300orgsite/are-we-doomed .
. Gideon Polya, “Latest Lancet Data Imply Adani Australian Coal Project Will Kill 1.4 Million Indians”, Countercurrents, 21 April 2017: https://countercurrents.org/2017/04/21/latest-lancet-data-imply-adani-australian-coal-project-will-kill-1-4-million-indians/ .
. Robert J. Kennedy Jr, “”Syria: another pipeline war”, EcoWatch, 25 February 2016: http://ecowatch.com/2016/02/25/robert-kennedy-jr-syria-pipeline-war/ .
. “Methane Bomb Threat”: https://sites.google.co/site/methanebombthreat/ .
. “Gas is not clean energy”: https://sites.google.com/site/gasisnotcleanenergy/home .
. Paul Craig Roberts, “Washington plans to nuke Russia and China:”, Paul Crag Roberts, 27 April 2017: http://www.paulcraigroberts.org/2017/04/27/washington-plans-nuke-russia-china/ .